Sometimes when you have too much to say, you end up saying nothing at all. I’ve tried to write many times this week. But instead of writing a word, I clicked “close” every time. Sometimes when life is too hard, you shut yourself off. You assure everyone around you that everything is fine and you try to believe it. I feel guilty because others have struggles much harder than my own. I have a child with special needs. So what? So do many, many other parents. Our story is not unique. Avery is healthy and happy and beautiful and I should feel lucky. Or so I have been told. But some days, instead of lucky, I feel frightened, frustrated, angry or sad. I’ve always had the attitude that everything will be okay. This is our normal and life is good. It’s not perfect, but it’s good. It seems you can only go on for so long fooling yourself into thinking your life isn’t hard. My life is hard. Avery is funny and loving, but she’s difficult. She doesn’t understand “danger.” She is always at risk and it’s taxing living in a constant state of fight or flight. I’m jealous of parents whose children are “normal” and I envy people who have time for themselves. Even a day. 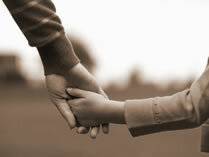 I’ve come to the realization that having a special child needs to be reconciled in one’s heart and mind. No matter how much I love my girl and how lucky I know I am to be her mummy, there’s a painful sense of loss that needs to be addressed. It hurts to see girls Avery’s age and to wonder what lies ahead for her and for our family. Sometimes when you’re hurting, you talk about it and hope that by acknowledging your pain, you can heal and learn to peacefully embrace your life. Wow. Thank you for saying what every other special needs parent feels (even if they can't admit it yet). Yes you need to grieve, you have lost some of the hopes and dreams you had for your child, and while new hopes and dreams will form, there has still been a loss. Grieve now so that you can move forward with joy.